Just after Sony's invite to "see the future"
handheld to Asia at the end of the month. 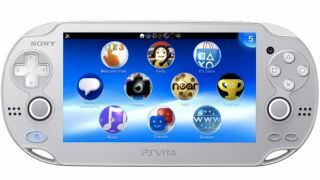 The Ice Silver edition of the PS Vita joins the ranks of the blue, red and white hues we've already seen. It'll hit Asia on February 28. It'll cost HK$2,280 ($294, £187) in Hong Kong, and is also promised to come to Malaysia, Singapore, and Taiwan. Apart from the new colour, the handheld remains the same as the standard black PS Vita. There's no word on whether the silver colour will reach other parts of the world. Sony has already teased a major announcement for February 20, involving the PlayStation symbols, and inviting us to "see the future". Which hints quite heavily that we could be seeing the PS4. Which would cast quite a shadow over a new colour of PS Vita, admittedly. The PS4 is rumoured to have an eight-core AMD CPU, AMD graphics, and more grunt than the Xbox 720. According to other rumours, the PS4 controller could have a Vita-esque touchpad where the Start, Select and PlayStation buttons are, opening up the gaming potential.